A partners desk is different from a normal desk in one very significant way – an antique partners desk, or indeed a contemporary partners desk, is finished on both sides therefore making it possible for two people to use the desk at the same time. The other big advantage of partners desks is that, because they are finished on both sides and usually have drawers and or cupboards on both sides, they do not have to be placed next to a wall in order to hide the unfinished side. A partners desk can be used anywhere in a room making it a very versatile piece of furniture. Possibly the best known partners desk is the famous “Resolute” Desk which was presented to President Rutherford B Hayes as a gift from Queen Victoria in 1880 as a “token of goodwill and friendship”. 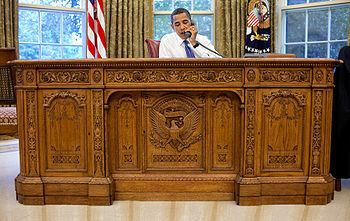 This impressive desk was built from timber taken from a British Artic Exploration ship named “Resolute.” It has been used in various locations around the White House but it was used in the famous Oval Office for the first time in 1961 at the request of Jackie Kennedy for use by President John F Kennedy. The only time this desk has ever left the White House was in 1963 when, following the assassination of Kennedy, the desk was part of a travelling exhibition along with the Kennedy Presidential Library. The current president, at the time of writing, is Barack Obama, who still uses the Resolute desk on a regular basis, in the Oval Office. After the Resolute was broken up there were in fact several desks ordered by the Queen. Four of those desks were designed by William Evenden, who also made the desks. If this desk ever came up for sale it would probably be outside the price range of most people but there are numerous lower cost replicas available. We always try to have in stock a respectable choice of antique partners desks including Victorian partners desks and examples from other periods in history as well. For those for whom the age of the desk is unimportant then we also offer a range of craftsman built contemporary partners desks. 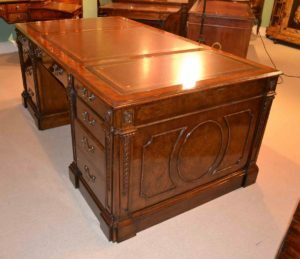 The following is a fine example of a Victorian “Kidney” shaped partners desk, made in Burr Walnut and offered for sale at just £4250. This is a sizable desk, being 181 cm (5ft 11 inches) in width and 100 cm, (3 ft 3 inches) deep, and it offers spacious work space for you, (and, of course,your partner if required), plus all the stationery and office supplies you need. There are no less than 12 drawers, (9 on the front, 3 on the back) built into this desk plus a further two cabinets located at the rear of the desk. This desk measures 79cm, (2ft 7 inches) in height. Please see the image and note that there is also a bookshelf located in the knee hole area of the desk which also acts as a modesty panel. 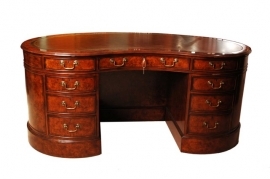 So, if you are in the market for a partners desk, antique or contemporary, take a look at our range. We will ship our antique partners desks to any location worldwide but please be sure to obtain a shipping quote before ordering.